SIOUX FALLS, S.D. 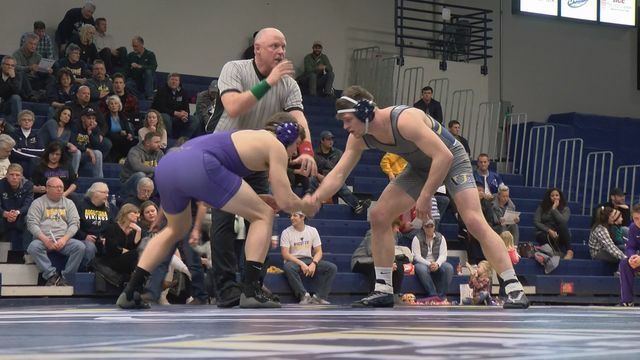 - Augustana made a habit of turning upset wins into dual wins, and even though the Vikings started Friday's dual with No. 9 Minnesota State with an upset win by Lukas Poloncic at 174 lbs., the Vikings could not hold off the Mavericks in a 20-10 loss at the Elmen Center. The loss snaps Augie's win streak at four, and drops them to 4-2 in duals overall, and to 3-2 in the Northern Sun Conference, while the Mavs improve to 8-1 overall and remain perfect in the NSIC at 5-0. The match began at 174 lbs., where Poloncic wasted no time in giving the Vikings an early lead, with a 7-3 upset win over No. 4 Zach Johnston. Poloncic opened the match with a takedown for the early 2-0 lead, and even though Johnston got that back with a reversal to even things at 2-2, Poloncic ended the first period with an escape and a 3-2 lead. Johnston scored the only point in the second, an escape to tie the match at 3-3, but Poloncic escaped, and then added a takedown with 15 seconds left, plus one point for riding time, to secure the 7-3 win and improve to 13-7 on the season overall and 4-0 in the NSIC with his ninth straight win. The Mavericks earned a decision at 184 lbs., to tie the dual at 3-3, but Clayton Wahlstrom put the Vikings back in front at 197 lbs., with his eighth straight win, a 15 -4 major decision over Dylan Butts. Wahlstrom led 4-1 after the fist, added a trio of takedowns in the second to take an insurmountable 11-3 lead into the third, where he added a takedown, and single points for stalling and riding time. Wahlstrom moves to 24-11 overall, to 4-0 in the NSIC and 5-0 in duals. Augustana's Ethan Cota and Minnesota State's Andrew McFall battled to a 0-0 tie through three periods before McFall won a sudden victory with a takedown early in the extra frame, but the Mavericks lost a team point after the win, to turn a 9-7 lead into an 8-7 lead through five matches. The loss of the one team point mattered little though, as the Mavericks won the next three matches to go up 17-7, and even though Colin Ayers earned an 8-5 decision at 157 lbs., to improve to 23-9 on the season and to 4-1 in the NSIC, the Mavs won the final match of the night to secure their eighth consecutive win. Vikings return to action next weekend with a pair of duals in North Dakota in their final road trip of the season, which starts at U-Mary on Saturday and ends on Sunday at Minot State. From there, Augustana returns home to host defending national champion St. Cloud State in the regular season finale on Thursday, Feb. 14.